In a landmark development for their national carriers, Kuwait and Iraq have reached an agreement to the long running dispute over Iraqi Airways' debts to Kuwait Airways. The USD500 million settlement ends a conflict which has plagued the development of both airlines and also paves the way for the development of a joint Iraqi-Kuwaiti airline venture. The two countries have initialled a final settlement agreement, under which Iraq agreed to pay Kuwait USD300 million in reparations over the destruction and seizure of Kuwait Airways assets during the 1990-1991 Gulf War. In addition, Iraq pledged to provide another USD200 million for a joint airline venture between the two nations. The funds for the joint venture will be paid in 1H2013. It is not yet clear what the new joint venture carrier will look like or what roles Kuwait Airways and Iraqi Airways will play in its establishment. The final settlement ends two decades of acrimonious bickering between the two nations over billions of dollars in reparations between their national carriers. Kuwait stated that the deal is in its best interests and officially ends the legal battle over the matter, but the new parliament, to be elected on 01-Dec-2012, can still reject the deal. Kuwait Airways had been seeking as much as USD1.3 billion in damages and interest over the theft of 10 aircraft and spare parts, committed when Iraq invaded Kuwait in 1990. While the cash going to the carrier is less than a quarter of the amount sought, the deal is a huge bonus for Kuwait Airways, which is struggling with heavy losses, intense local competition and a troubled turn-around programme. The legal battle over the dispute had been fought in courts as far away as London, Montreal and Amman and was a continual source of conflict in the already tense Kuwait-Iraq political relationship. After repeated failure by Iraq to pay reparations, Kuwait Airways began a series of legal action to force payment. In 2005, a London High Court issued a landmark ruling that Kuwait Airways was allowed to seize both Iraqi Airways assets and Iraqi national assets to recoup the damages. The ruling was contested, but the outcomes were potentially devastating for Iraqi Airways. The carrier, which was attempting to rebuild itself in a still fragile economic and security climate in Iraq at the time, was faced with seizure of any Iraqi Airways aircraft landing in Europe. The aircraft used in the airline's first flight to Europe in two decades was impounded at London Heathrow and the carrier’s CEO even suffered the ignominy of having his passport temporarily confiscated. The Iraqi Government called on other Arab nations to protest against Kuwait’s actions, and to pressure Kuwait into abandoning its claims for reparations. Regardless of political demands, the legal cases kept piling up against Iraqi Airways. In 2008 the Quebec Superior Court ruled that Kuwait Airways could seize Iraqi Airways assets in Canada. In 2010 Kuwait Airways won a seizure order from the same court for 10 Bombardier CRJ900 aircraft, ordered in 2009 and valued at around USD400 million. In 2011, a Jordanian court ordered that USD1.5 million in assets were to be frozen or recovered in Amman. Kuwait was even seeking the seizure of Iraqi oil assets, up to and including oil tankers, as a method of settling the debt. The 2010 Canadian judgement almost forced the Iraqi government to put the carrier into voluntary bankruptcy, dissolving it as the national airline. In May-2010, the government even went as far as to issue a statement that the carrier’s operations would be terminated and replaced by four private carriers, allowing it to side-step the legal dispute. While that plan was never fully implemented, private charter operator Al-Naser Airlines was eventually designated as a second flag carrier for Iraq, as a fall-back position. Al-Naser Airlines began operating to Sweden, the UK and Germany in late 2010 as an alternative to Iraqi Airways, which still faced the possibility that its aircraft operating to Europe could be seized. Kuwait Airways and Iraqi Airways will both benefit immensely from the resolution of the dispute. The deal with Iraqi Airways provides a shot in the arm financially for Kuwait Airways and allows it to restart its long-running privatisation process. The USD300 million will provide much needed liquidity for Kuwait Airways. The carrier has reported just a single profitable year in the past two decades, and expects its 2012 losses will be more than KWD80 million (USD283.7 million), due primarily to increased fuel and maintenance costs and a higher wages bill. Losses in 2011 were reportedly almost USD550 million, mostly due to the Arab Spring related civil unrest. The heavy losses at the airline are a legacy of the 1990-1991 conflict and the carrier’s inability to recover due to the rapid development of the Middle East aviation market and the rise of the Gulf sixth freedom carriers, which have eaten into many of the carrier’s traditional markets. Kuwait Airways faces a highly competitive home market, thanks in part to the country’s open skies regulation. The policy has successfully driven growth at Kuwait International Airport, but Kuwait Airways and other local airlines believe the policy has led to regional competitors dumping capacity into the market, driving down margins. 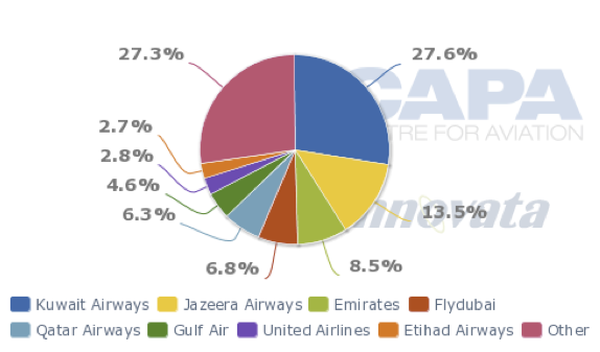 Emirates, Qatar Airways, Gulf Air and flydubai all control a significant proportion of capacity at Kuwait International Airport (KIA). Growth at KIA has slowed significantly over the past few years, with the Arab Spring blunting traffic at the airport in 2011. The airport is also operating above its design capacity of seven million passengers p/a. The airport is expected to handle nearly nine million passengers in 2012. A terminal project to expand capacity to 13 million passengers p/a was launched this year and a tender for the development of a second terminal is due to be awarded in mid-2013. The USD2.5-2.9 billion project is expected to lift capacity beyond 20 million passengers p/a and is projected for completion in 2016. 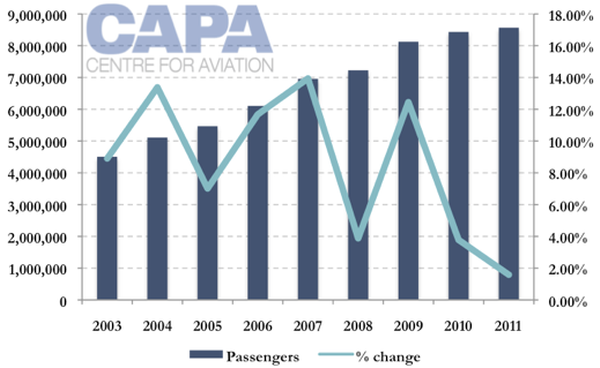 Ultimate capacity with planned expansions could be raised as high as 50 million passengers p/a. There is also the presence of Jazeera Airways in the local market. While the private low-cost carrier has scaled back its operations considerably compared to a few years ago in pursuit of profitability, it still manages to capture a considerable local market share and provides price-point competition to many of the same destinations that Kuwait Airways serves. At the same time as the reparations deal was signed, Kuwait Airways Corporation was declared a shareholding company under the name Kuwait Airways Company. The royal decree also exempted its “rights and judicial rules against Iraqi Airways and the Republic of Iraq”, and freed up legislation that had blocked it from restructuring its assets, including its fleet. Under the decree, the Kuwaiti Government will still cover any losses experienced by Kuwait Airways. It will also cover payments for any staff who do not wish to remain with the carrier once it is privatised, or allow them to transfer to another government department. The social implications of the long-planned privatisation had been one of the issues that had dogged the privatisation process. Ending the long running court battle also frees up management resources to concentrate on the operational and financial turn-around. In Nov-2011, the carrier suspended its privatisation, opting instead to focus on re-developing itself as a meaningful competitor in the region. The privatisation legislation was sent back to the Kuwaiti parliament, with the brief of establishing a legal framework for the restructuring and reformation of the carrier prior to another run at privatisation. The original 2008 privatisation plan stated that 35% of the carrier would go to a private strategic investor, which would help the carrier turn around its operations. This would be followed at a later date by a 40% IPO to the Kuwaiti public. The Kuwaiti Government would retain a 20% strategic shareholding and several seats on the board. An employee share trust would have control of the remaining 5%. The 12-month break in the privatisation process has not been an unqualified success. Staff went on strike early in the year as part of wider national protests focused on social issues. The carrier is also experiencing operational difficulties and has not been able to conduct any meaningful refleeting and is plagued by heavy losses. In Jul-2012, safety concerns saw the carrier forced to ground five aircraft and temporarily suspend operations to Damascus, Cairo and Beirut. Management at the carrier blamed local media for carrying out a “tendentious” campaign against it. For Iraqi Airways, settling the dispute allows the carrier to go ahead with its long planned but much delayed fleet expansion. The 2010 Quebec Superior Court order over the Bombardier regional jets held up delivery of the new aircraft to the carrier, for fear they would be claimed by Kuwait Airways. Iraqi Airways was only eventually able to circumvent the problem by leasing aircraft through the Iraqi Finance Ministry. Iraq has also been dithering over the delivery of the final four CRJ900s, but is expected to take delivery of the remaining aircraft in 2013. The Iraqi Foreign Ministry announced the deal will lift “all restrictions and difficulties rebuilding Iraqi airlines and on its freedom to buy new planes and establish its fleet”. The delivery of 30 Boeing 737-800s, originally expected to commence in 2010, is now expected to begin in either very late 2012 or in 2013. 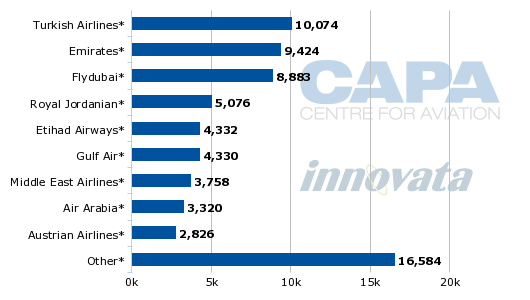 The carrier also has 10 Boeing 787s on order, but deliveries are not projected to commence until 2016 or 2017. The carrier is also looking at lease options in the short-term, for both short-haul and long-haul aircraft. The end of the court action means that it can operate to Europe without fear of having aircraft grounded or repossessed. Iraqi Airways clearly has ambitions of re-connecting Iraq to the rest of the world. It is also looking at becoming a significant player in the fast developing Middle East aviation marketplace. Earlier this year, the airline announced its plans to develop an Iraqi aviation institute to train new staff and develop and improve the expertise of existing workers. With 44 aircraft still to be delivered, the carrier will require a considerable influx of new and qualified staff. Several of the aircraft already operating for Iraqi Airways have been wet-leased from other carriers. With a developing national economy and a massive need for infrastructure redevelopment, Iraq has become a magnet for foreign investment, which is also attracting increasing numbers of airlines to the country. More than two dozen airlines have added services to Iraq since 2009. To cope with the influx and to support its own long-term nation builiding plans, Iraq is now racing to develop its aviation infrastructure. USD1 billion will go into airport developments this year and the Iraqi government has called on international support to help it fund more airport and rail infrastructure projects. Iraqi Foreign Minister Hoshyar Zebari said the deal is a “breakthrough in the relationship” between Iraq and Kuwait. The settlement of the agreement is one of a number of moves that have thawed the relationship between the two countries over the past 12 months, including restoration of a bilateral air services agreement earlier this year and a plan to jointly exploit previously disputed oil fields. Kuwait’s Ministry of Communications and Iraq’s Ministry of Transport expect to finalise the legal procedures relating to the implementation of the joint venture agreement within the next three months. What roles each country and carrier will play in the new joint venture is unclear. Kuwait has not announced what funds, if any, it plans to invest in the new airline. With Iraq in desperate need of domestic and international aviation development and Kuwait Airways already facing intense competition at its hub, an Iraqi base is the logical home for the new carrier.